I'd like to get clarification on the expected transmission of non-interlocked frames in the case of multiple XFER_RDY frames received by the initiator. 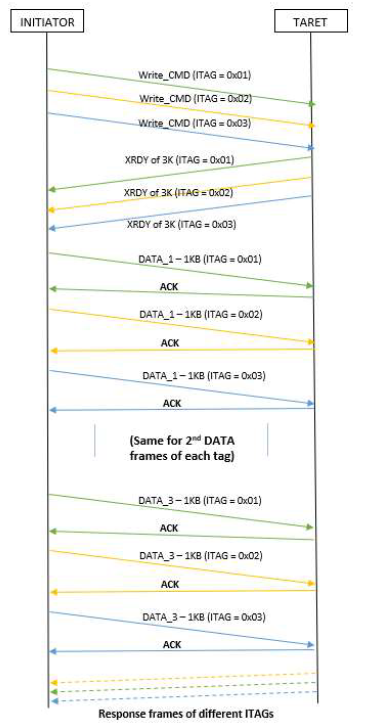 Per Figure 173 of the SPL4 spec, all non-interlocked frames (DATA frames) with the same initiator port transfer tag (ITAG) are transmitted together without waiting for ACK/NAK. Once transmission of all data frames with the same ITAG is completed and all the data frames are responded with ACK/NACK, then transmission of DATA frames with different ITAG values begins. Until all SSP frames have been acknowledged with ACK or NAK even if transmit SSP frame credit is available. 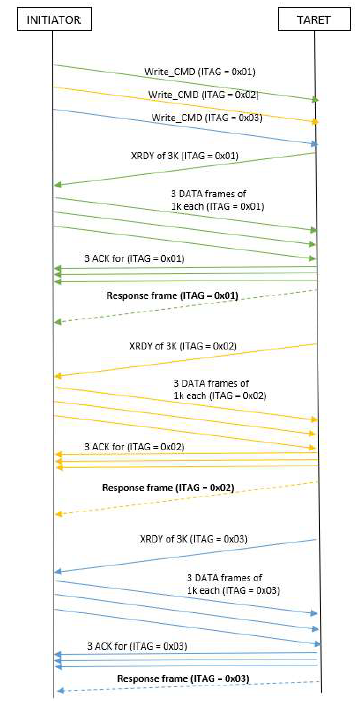 *   Here, there is no arbitration define at Transport layer, for handling multiple ITAG DATA frames transmission once XRDY frame received for those - as a result Initiator will prepare 1st DATA frame of each ITAG received, and as all three frames have different ITAG value, as per specification each DATA frame will wait for ACK before transmitting another DATA frame with different ITAG. Is our understanding correct? Do you see any implementation/execution conflict?